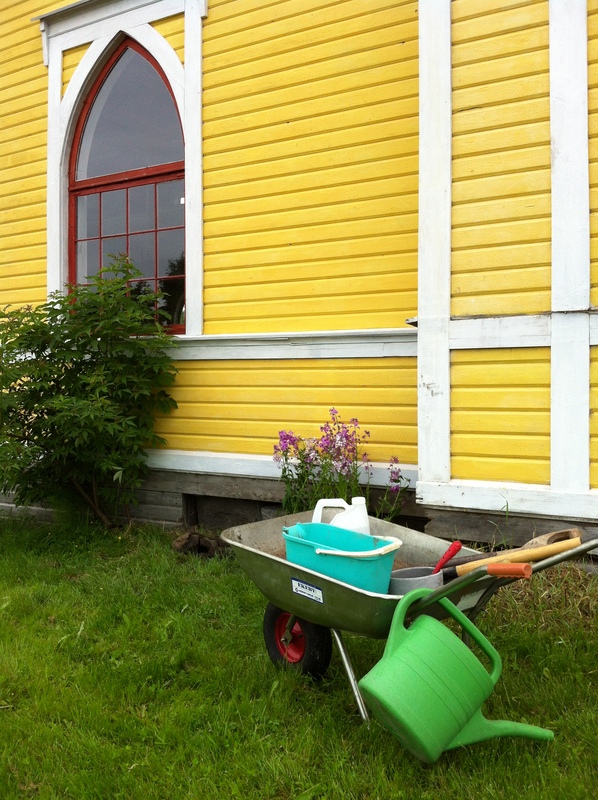 Guerilla gardening at the Lutheran Chapel and former EFS Church in Bollstabruk, Sweden. This is a message to the International Community of Bollstabruk, present and elsewhere in the world, sent to you by one of the guerilla activists, presently in Bollstabruk. We are all safe and sound and hope you are too. Last week we confirmed that the kebab rolls at Sylos Pizza, Kebab & Grill in Kramfors are keeping the same excellent, tasty standard. It’s such a nice place to go. In spite of our guerilla ways we always recieve a Royal treatment. Very nice, indeed. Which reminds me to inform you of H.M. King Carl XVI Gustaf and Queen Silvia’s visit to Bollstabruk on 14 August 2013 in connection with The King’s 40th jubilee. We are hoping they will take a stroll on Kvarnbacksvägen to admire the yellow beauty and the guerilla gardening that has been going on there. Of course, we would be thrilled if the Royal Highnesses would take an interest in the Chapel. Maybe pull some string for us? The activist community is cutting the grass, planting flowers and pretty soon we’ll scrub the benches and hardwood floor in the main prayer hall. A soft green, pine soap will be used for that. The height of the ceiling and the light coming in through the astonishing windows together with the smell of fresh flowers and a scrubbed floor is a luxury we cannot resist and would like to share. Mission accomplished today at the Luther Chapel and former EFS Church, Bollstabruk, Sweden. Our friend, the owner of the Chapel, art historian, former museum curator, author and house hugger, Lars Sjöberg, will be at the Chapel on Thursday 27 June 2013. An event is scheduled for 18.00 hours. 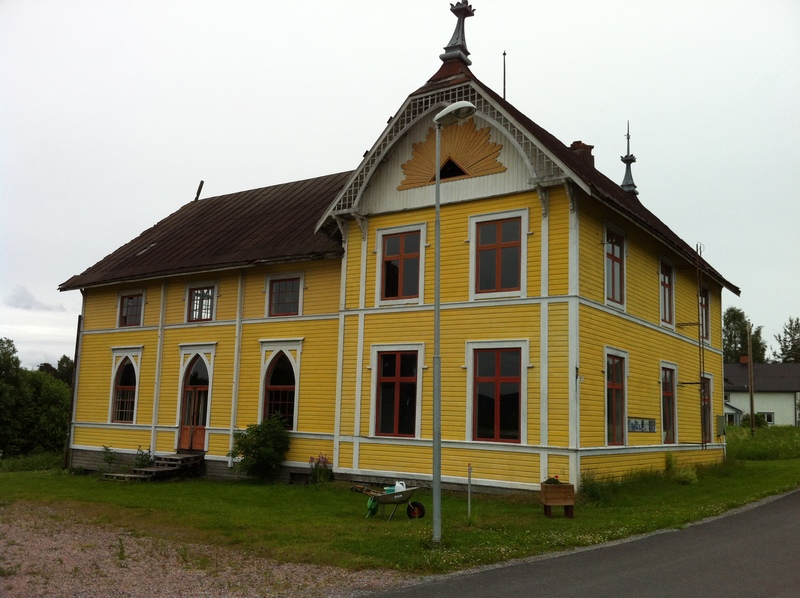 Thursday 27 June is the starting date for the cultural events in the old Foundary, further down on Kvarnbacksvägen. There will be expositions, arts and crafts, music and much more every day until 30 June and there is more to come in July. Stay posted. More news will follow on this. We can also report that the representative of the Mexican Consulate in Bollstabruk managed to connect two Geordies at the local soccer field. This was done by way of Portugal, Geordieland, Örnsköldsvik, Mexico and Bollstabruk. The coffe, cake, hot dogs were, as always, very good and the Bollsta Ladies Team won the game. We hope Lord G will not take offense and come back to see us soon. Last but not least, Nylands Järn, a music collective inspired by the hardware store in our twin village Nyland has solved the matter of the population decline Swedish television pointed out to us for some time ago by saying ”There won’t be anybody in Bollstabruk within 30 years”. We believe there must have been some mishap in MS Excel by the statisticians. The music collective, Nylands Järn, is leaning on a tried-and-true method as well as YouTube. The Guerilla Society of Bollstabruk believe in the success of their strategy and wish them all the best. We are looking forward to their concert at the Foundary in Bollstabruk on 14 July at 15.00 hours and would like to contribute to their future fame and fortune by posting their latest music clip on YouTube (in Swedish only). Enjoy!